SOU’WESTER- THE MAGAZINE FOR ALL FOUR OF THE WESTERN PARISHES…. SOU’WESTER is a magazine for all 4 Western Parishes and is again free of charge and delivered to your door. Shore to Shore Parish Magazine was a magazine produced for the parishes of St Saviour and the Forest once every two months. After many years the publication has now stopped . The last edition was published in September 2014. The wonderful editor of Shore to Shore was Lily Mauger and we had a Champagne reception for her to say Thank You , along with all the others on the team. 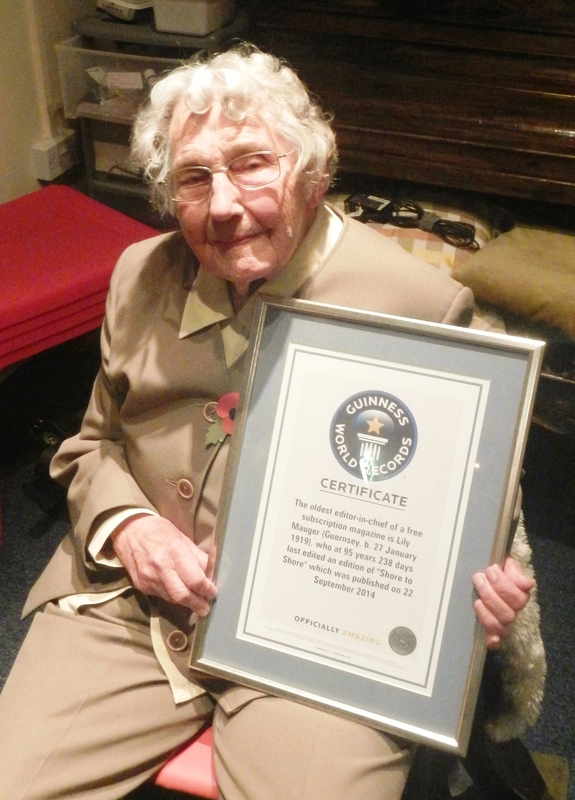 Fergus Dunlop approached the Guinness Book of Records and after much hard work they awarded Lily the recognition that she was ‘THE OLDEST EDITOR OF A FREE MAGAZINE ‘ What an achievement at the age of 95. Sadly dear Lily is no longer with us. She died in March 2018 at the amazing age of 99, Sorely missed but her amazing talent, easy humour and achievements will be long remembered.